Whilst the Ranger Service has been silent in terms of reporting progress over the winter that doesn’t mean it has been quiet in getting things done. Working closely with Discover Tiree and the RSPB we have been revamping and producing new brochures. The updated Tiree Visitor Map will be out soon along with a new “out and about” day visitor’s brochure for those making use of Thursday afternoon ferry sailings and not taking the “Tiree Tour”. We are part way through preparing a further four tourist walk maps and a full schedule of weekly guided walks is also due out soon. Some of you may have noticed that frames have appeared at the various parking areas. These will contain information panel’s specific to each location and cover items such as machair, flora and fauna, water sports, island identification montages and identification of whales, dolphins and basking sharks. The boards should be in place during May. Despite a wet and windy winter we do not seem to have suffered the same degree of coastal erosion as last winter. 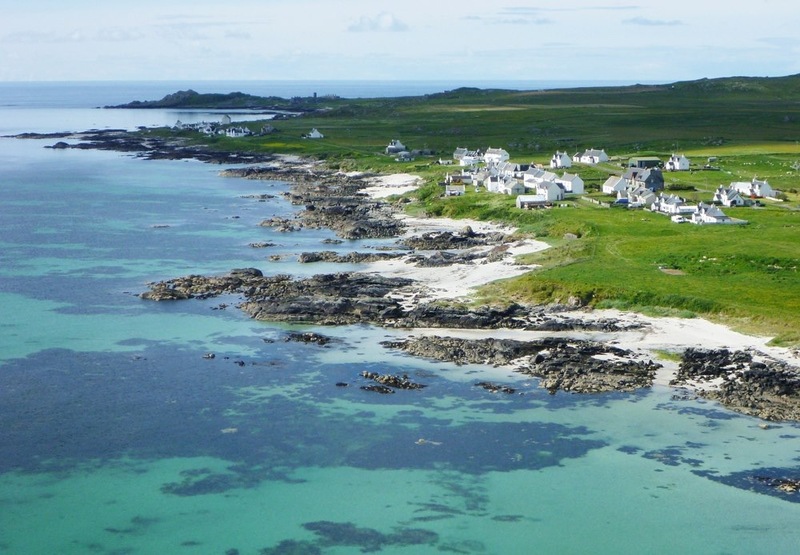 The works undertaken at Balephetrish and Crossapol have so far helped stem the onslaught of tide and winds and the general consensus has been that if the remedial works undertaken last year had not been done then further substantial damage would have occurred. I have also been asked about the posts with yellow markings on at Gott Bay. These have not been installed by the Ranger Service but by Argyll and Bute Council as datum points to measure the effects of erosion. Similar smaller pegs have also been installed along Balephetrish Bay. The lambing season has barely started along with many young calves also being born and yet the first report of dogs not being kept under control has already reached me. This is a problem that occurs time and again so can I please implore both local and visiting dog owners to keep their dogs under control (preferably on a lead when near livestock) especially at this time of year. 1. Don’t take your dog into fields where there are lambs, calves or other young animals. 3. If you go into a field of farm animals, keep as far as possible from the animals and keep your dog on a short lead or under close control. 4. If cattle act aggressively and move towards you, keep calm, let the dog go and take the shortest, safest route out of the field. 5. During the bird breeding season (usually April to July) keep your dog under close control or on a short lead in areas such as moorland, machair, grassland, loch shores and the seashore. 6. Pick up and remove your dog’s faeces if it fouls in a public open place or where there is a risk to farming interests. 7. In recreation areas and other public places, avoid causing concern to others by keeping your dog under close control. Looking for something to replace that spot on your windscreen where the tax disc used to go? The latest Tiree 2015 stickers are now in stock and available from the Ranger, Blue Beyond Gallery, Wild Diamond, Ceabhar Restaurant and Rockvale Guest House. Stickers are priced £5 and all proceeds go back into environmental improvements.